Dark sky observing is to be after sunset at a site to be posted on the Yahoo Group. As noted above, check the LCAAS Yahoo Group to see if anyone is going to be at the field. The public is welcome but please see the Observing Etiquette section on the Observing page. Friday only is listed for Dark Sky dates; Saturday is the backup if Friday is clouded out; other local events also listed if applicable. March 16 - Dark Sky (Messier Marathon opportunity). April 13 - Bangor site. 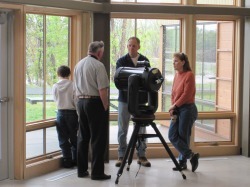 April 21 - Astronomy Day - Riverside Park, Solar observing from 11:00am - 2:00pm, night observing from 8:00pm ~ 10:00pm. May 8 - Club Banquet (members only) - David Reay's in Onalaska, 6:00pm social, 7:00pm dinner. May 11 - Dark Sky - G-E-T site. June 15 - Dark Sky - Bangor site. July 13 - Dark Sky - G-E-T site. July 27 or 28 - Mars close approach, public outreach at Hwy 33 scenic overlook east of La Crosse, 9:00pm - 11:30pm. Should also see Venus, Jupiter, and Saturn. Cloud date is July 28. August 10 - Dark Sky - Bangor site. August 17 - Houston Nature Center, 8:00pm Short program and Stargazing. September 7 - Dark Sky - G-E-T site. September 8 - Stargazing with Mississippi Valley Conservancy at FSPA Villa, 7:30pm. October 5 - Dark Sky - Bangor site. 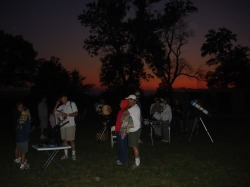 October 13 - Astronomy Day - Riverside Park, Solar observing from 11:00am - 2:00pm, observing from 6:30pm to about 10:00pm. October 19 - Outreach with La Crosse County 4-H Club. Harry explaining the finer points of a Celestron Nexstar 11 Schmidt-Cassegrain Telescope. 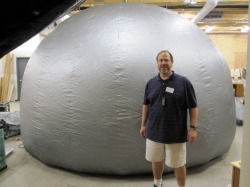 Paul Kinzer can give presentations on the night sky in a portable planetarium. 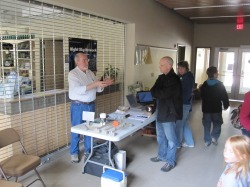 Bruce Klubertanz explaining the science behind telescopes.